2 deliciously whipped protein bars with 20g protein, no added sugars and high in fibre. An anytime snack for adults interested in new, delicious ways to get protein. Now any day can feel like a cheat day! Protein blend (milk protein isolate, whey protein isolate, milk protein concentrate, calcium caseinate (milk), emulsifier: soy lecitin), milk chocolate flavour coating (18%) (sweeteners: isomalt, sucralose; non-hydrogenated palm and palm kernel oil, whey (milk) powder, fat-reduced cocoa powder, wheat flour (gluten), emulsifiers: soy lecithin, e476; flavouring), humectant (glycerol), sweeteners (sorbitol, erythritol), fructooligosaccharides, isomaltooligosaccharides, sunflower oil, flavourings, white chocolate flavour drizzle (1%) (sweeteners: isomalt, sucralose; non-hydrogenated palm and palm kernel oil, whey powder, wheat flour [gluten], emulsifier: soy lecithin; flavouring), sodium chloride, fat-reduced cocoa powder, antioxidant (tocopherol-rich extract). Excessive consumption may produce laxative effects. Not suitable for diabetics. 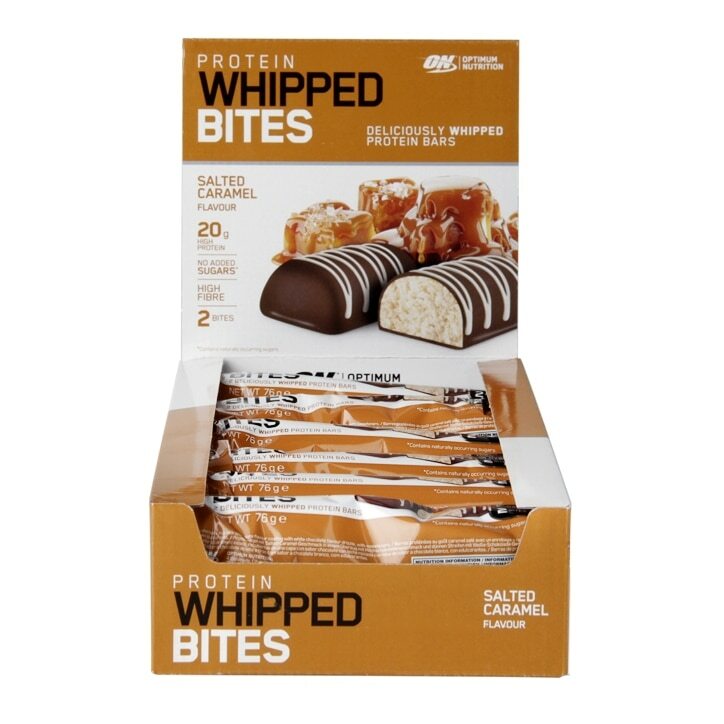 Optimum Nutrition Whipped Bites Salted Caramel is rated 4.8 out of 5 by 4.